Everyone loves pizza. No really – pretty much everyone loves pizza. According to the USDA, one in eight American adults eats it on any given day. Judging by how much we enjoy pizza, we think that sounds pretty accurate. 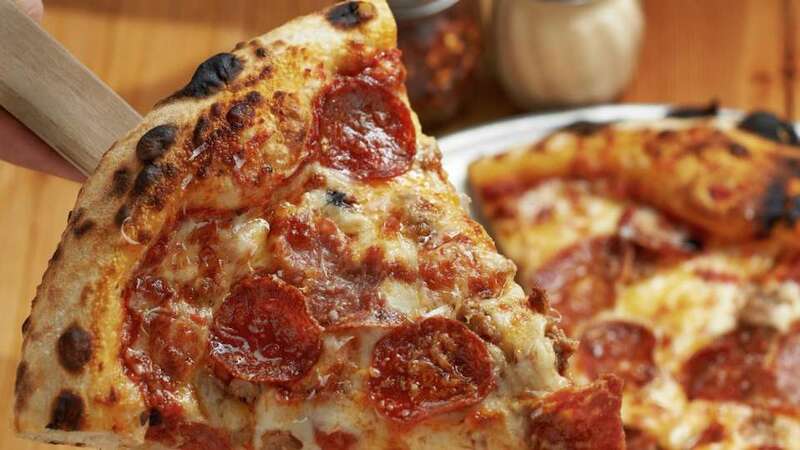 It’s impossible to resist gooey cheese, chewy crusts and tasty toppings. Pizza fans have a lot of choices in Vegas. We’ve got Chicago style. We’ve got New York style. We’ve got vegan. We’ve got gluten-free. 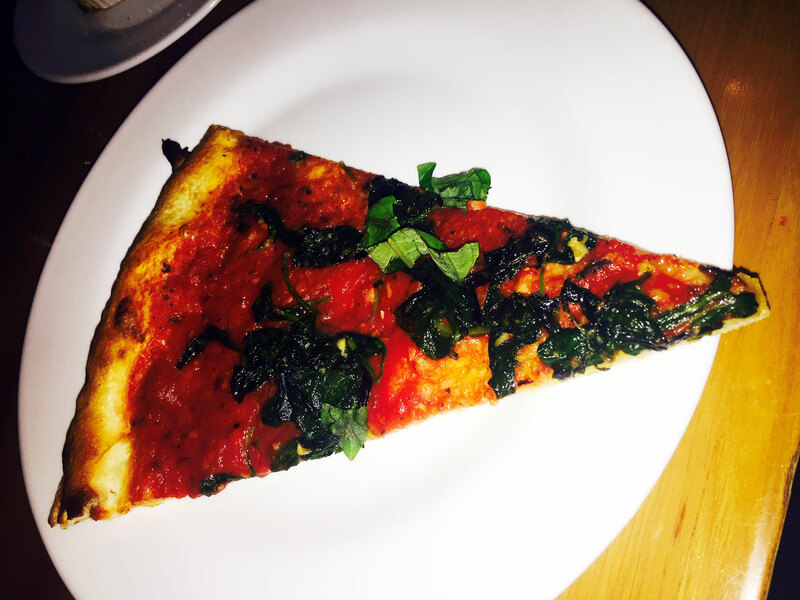 The Gotham pizza at FIVE50, photo courtesy of Aria. The name of this restaurant comes from the temperature that chef Shawn McClain says is the ideal temperature to cook pizza. We believe him. This pizza is amazing. He’s also a highly-acclaimed chef so we’re pretty sure he knows what he’s talking about. The East Coast-style pizza is cooked in a wood-fired oven and you can either build your own pie or order a signature pizza. Build-your-own toppings include sweet peppers, wood-fired tomatoes, padron peppers, whipped ricotta, white anchovy and smoked bacon. The signature pies include a mouthwatering truffle pizza with potato, truffle salami, béchamel and fresh-shaved truffle on top. Carnivores will enjoy the Gotham, created with house-made sausage, pepperoni and salami. Other options include everything from a simple margherita pizza to the more adventurous North Beach, which is topped with clams and smoked mozzarella. If you need some pizza on the go or after restaurant hours, FIVE50 also has a walk-up slice counter. Everyone knows beer is the perfect companion to pizza and another reason we love FIVE50 is for their beer selection. There are 12 craft brews on tap, including regional and local beers. The Bella Napoli pizza at Dom DeMarco’s, photo by Jeannie Garcia. Dom DeMarco’s, 9785 W. Charleston Blvd. The pizza here is SO good, that even President Obama had some delivered to his hotel when he was in Vegas. With all the different pizza joints on and near the Strip, that alone tells you something. This pizza restaurant is a local’s favorite. Dom DeMarco’s is located in Summerlin, just a couple miles east of Red Rock hotel. This place is also awesome for vegans: Both the New York style-crust and deep dish crust are vegan-friendly. There is also vegan cheese available, so veggie heads can still enjoy gooey goodness on their pizza. But our personal recommendation doesn’t even have cheese: The Bella Napoli is a cheese-less pizza with San Marzano tomatoes, spinach, chopped garlic and extra virgin olive oil. It’s a tasty favorite for both vegans and non-vegans alike. Dairy and/or meat loving folks have even more options. The deep dish Di Fara Special features hand-cut pepperoni, fresh and aged mozzarella, grana padano (aged Italian cheese), fresh basil, and extra virgin olive oil. Another popular choice is the Pesto — pesto sauce with garlic, sundried tomatoes, caramelized onions and grilled chicken, topped with a blend of mozzarella and sharp provolone. 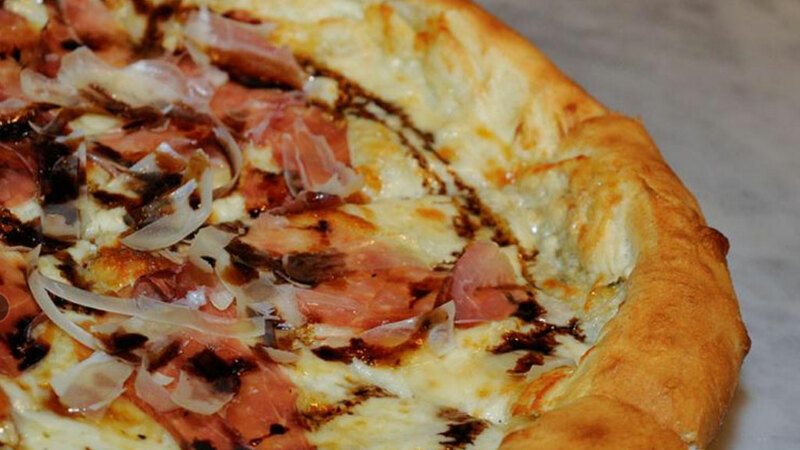 You can always jazz up any pizza with truffle oil too. In addition to plenty of pastas and appetizers (including oh-so-amazing house bread), we hear the seven-layer carrot cake topped with white chocolate shavings is heavenly. We say Dom DeMarco’s is worth the 20-minute drive from the Strip. The award-winning pizzeria and its sister chain, Di Fara Pizza, received praise from Zagat, New York magazine and New York Daily News. And unless you’re in Brooklyn, Las Vegas is the only place you’ll enjoy this beloved pizzeria. Here’s a little secret: While we recommend the whole dining experience at Dom DeMarco’s, there’s a Di Fara walk-up inside Caesars Palace if you’re looking for a quick bite. There aren’t as many choices, but you’ll get your New York style pizza fix. Metro Pizza is a longtime local favorite. The tasty brick oven pizza is handcrafted from fresh ingredients daily. You can choose to top your pizza the way you like with things like pepperoni, mushrooms, jalapenos, black olives and pineapple. There are also specialty pizzas like the Gotham with pepperoni, mushrooms, sausage, peppers and onions; the San Gennaro with sliced meatballs and fresh garlic; and the Memphis, a barbecued chicken pizza. You can also find stuffed pizzas on the menu, which include two layers of dough stuffed with two layers of cheese and your favorite toppings. Sounds like twice the goodness to us. Trust us when we tell you that you’ll want to get some Nuke fries or garlic knots to go along with your pizza. Pair it with one of Ellis Island’s microbrews and you’re good to go. Photo courtesy of Pizza Rock. Pizza Rock, 201 N. 3rd St.
We’re not sure if it’s called Pizza Rock because of the music playing or if it’s because owner Tony Gemignani is such a rock star in the pizza world. Gemignani is the first and only Triple Crown winner for baking at the International Pizza Championships in Lecce, Italy; and the 2007 World Champion Pizza Maker at the World Pizza Cup in Naples, Italy. Pizza Rock features a variety of Italian and American pizza styles (all cooked in one of four different ovens) including Neapolitan, Classic Italian, Classic American, Sicilian, Roman and Gluten Free. It’s not often you get to eat pizza that has won medals and world cups, so when you’re at Pizza Rock you’ll want to try Gemignani’s award-winning pies such as the Sicilian-style burratina di margherita, which won the Gold Cup Pizza Championships; Napoletana-style margherita, which won the World Pizza Cup; and Cal Italia (asiago, mozzarella, imported gorgonzola, sweet fig preserve, prosciutto di Parma, Parmigiano-Reggiano and balsamic reduction), which won the Gold Medal in the Food Network Pizza Champions Challenge. Secret Pizza isn’t really a secret anymore. When it first opened, the nondescript location and lack of signage made it a bit of a challenge to find, but the cat is out of the bag. You’ll often see a long line winding down the hallway at 3 a.m. This is where you go if you need a slice after you’ve been partying at Marquee all night. Secret Pizza is a tiny, standing room-only place. At the walk-up counter you’ll find fresh, incredibly tasty thin-crust pizza like pepperoni, cheese and veggie offered by the slice. You can also order a whole pie to go. The Goodman, photo courtesy of Pop Up Pizza. If you’re downtown, one of the best places to grab a slice is Pop Up Pizza, which is made with fresh ingredients and homemade tomato sauce. A lot of the pizzas are named for famous Vegas places and faces. The Main Street is topped with mozzarella and special pepperoni flown in from Chicago. 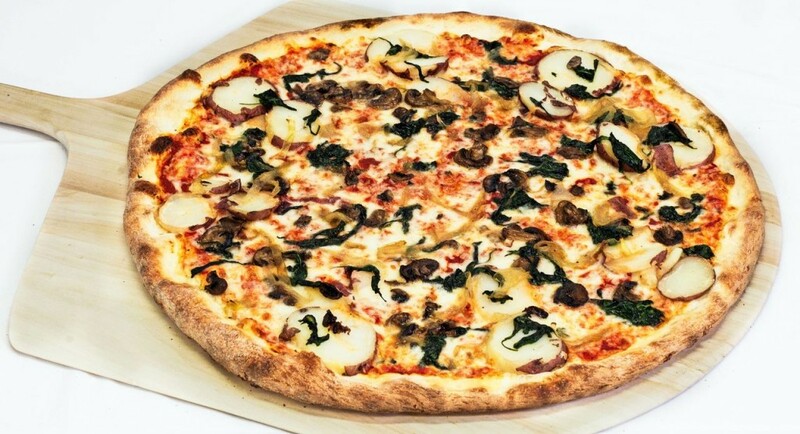 Try a slice of the “Goodman,” which features spinach, potatoes, caramelized onions and mushrooms. “The White Chapel” is – you guessed it – a white pizza made with mozzarella, ricotta, roasted garlic oil and sautéed spinach. Health conscious diners will appreciate the vegetarian and vegan varieties of pizza. 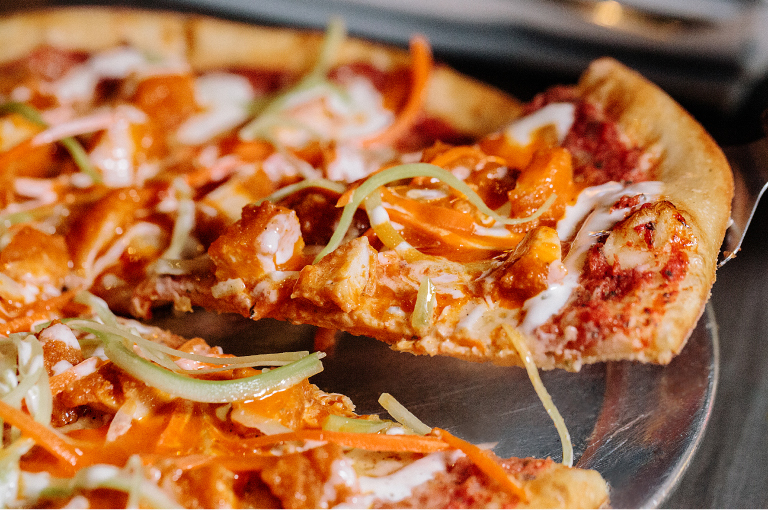 Buffalo chicken pizza, photo courtesy of Slice of Vegas. Grab a slice of gourmet pizza at this casual spot in The Shoppes at Mandalay Place between Mandalay Bay and Luxor. Slice of Vegas serves New York-style pizza and specialty pizzas including a Greek pizza, a Buffalo chicken pizza and a four cheese truffle pizza with garlic alfredo sauce, mozzarella, fontina, ricotta, Parmesan reggiano and truffle oil. Sign us up for that one! Slice of Vegas also has a full vegan menu with pizzas like a Garden Faux Pie and the BBQ Chick’n. Grimaldi’s coal brick-oven pizza, photo courtesy of Grimaldi’s. Grimaldi’s is a New York institution famous for its thin-crust pizza made with secret recipe dough and baked in a coal-fired brick oven. Build your own pie with white, pesto or red sauce and choose from toppings including artichoke hearts, meatballs, oven-roasted sweet peppers and more. Frank Sinatra was a fan and regular at the New York restaurant and legend has it he might have even had Grimaldi’s pizza flown to him in Vegas when he was performing here. It doesn’t get much cooler than that. Photo courtesy of 800 Degrees Pizzeria. Want your pizza pronto? 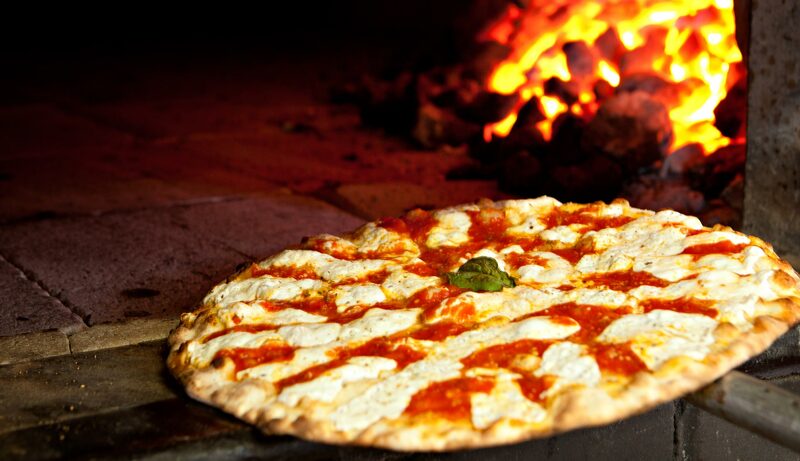 At 800 Degrees the Naples-style pizza is cooked in less than a minute in a stone hearth oven over almond wood. Sounds fancy but what that means is your pizza is ready by the time you’re done paying. Start out by choosing a crust – either original Neopolitan, crispy or gluten-free. Then choose a base – margherita, Bianca, marinara or verde (pinenut basil). Finish it off with proteins, cheese and veggies to make your perfect pie. The dough is made by hand and the pizzas feature fresh ingredients. Meat toppings include bacon marmalade (that can’t be bad), anchovies, rock shrimp, rosemary ham and more. A variety of cheese is available including gorgonzola, feta, fontina, goat cheese and of course, mozzarella. For vegetables, choose from things like broccolini, oven roasted tomatoes, butternut squash and arugula. Specialty pies are also available including the Angry Bee with soppressata, garlic, Calabrian chiles and honey or the Tropicale with roasted pineapple and rosemary ham. Naked City Pizza, 4608 Paradise Rd. If you watch “Diners, Drive Ins & Dives” on the Food Network you might have seen Naked City Pizza on an episode. They’re famous for their Guinea Pie, which was featured on the show. It’s made with meatballs, spinach, ricotta, mozzarella and white garlic sauce. Naked City serves authentic Buffalo, New York-style pizza by the slice, a quarter sheet, half sheet or full sheet. You can get a garlic crust, garlic sesame crust or Kimmelweck crust (a New York state favorite similar to a Kaiser roll with caraway seeds). Toppings include sweet peppers, green olives, marinated tomato, artichokes and more. Some of the specialty pies include a chicken finger pizza with chicken fingers, blue cheese dressing and mozzarella and the Naked City Pizza, made with pepperoni, house-made Italian sausage, sweet peppers, onions and green olives. You must pair your pizza with an order of Suicide Fries (also featured on “Diners, Drive Ins & Dives), which are topped with a hot pepper mix and habanero sauce. Editorial contribution from Jeannie Garcia.